I received a nice email from Juraj Dudáš, contest director for Model Club Trnava in Slovakia. 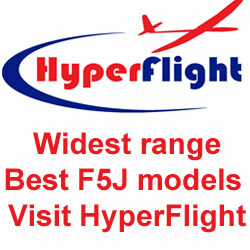 This is the club that manages the popular international Intertour F5J contest series. Club Trnava is also very active in hosting F5J contests themselves. Club Trnava concludes their year’s flying season with a triad of back-to-back F5J contests in mid August. You can see the pilot’s list here. The flyer for the Dubnica F5J event is here. As of today there are 188 pilots from all over the world signed up for one or more of these contests. You might be interested in the maximum pilot counts for each of the competitions: a limit of 112 in the Dubnica F5J event (96 enrolled so far), a limit of 144 in the F5J World Trnava Visegrad Cup (162 enrolled, presumably a waiting list), and a limit of 144 for the 2nd F5J World Challenge 2017 (177 enrolled). I’m happy to report that USA pilot Ali Khani (FlightComp) will be participating in the World Challenge on Aug 19-20. Have a great contest Ali and report back how it goes. The second F5J USA Tour contest for the 2016-17 season is completed: F5J in Vegas (Sandy Valley NV). A total of 44 pilots completed at least the minimum 4 rounds and flew both days in a very windy but exciting event. Results are available here. CONTEST ANNOUNCEMENT: Steve and Michelle Manganelli and Steve Neu of Neumotors are pleased to announce the 3rd Hawaiian Open Cup for FAI-F5B Motor Gliders- Multi Task and the 1 st ever Hawaiian Open Cup for FAI-F5J Motor Gliders-Thermal Duration. Invitation : The Hawaiian Open Cups are open to all International competitors having FAI affiliation. US Residents should be members of AMA. Site Location : The world famous Kualoa Ranch, town of Kahaluu, Island of Oahu, State of Hawaii, USA. This is the location where many tropical themed movies have been filmed including Jurassic Park/World, Kong-Skull Island and several others. Take a look at the site here: http://www.kualoa.com/ . Take a virtual tour of the breathtaking site here : https://youtu.be/SiXYz4JVhSI . Keep the time stamp on while watching, the area depicted between 1:32 and 1:35 is where we will be flying. Scheduled Rounds : Total of (5); (2) August 10 and 11, (1) August 12. We could have more or less depending on number of entrants and weather; the site access period is fixed. Radio Frequency : 2.4 Ghz spread spectrum transmitters are required. There will be no frequency control performed by contest organizers. 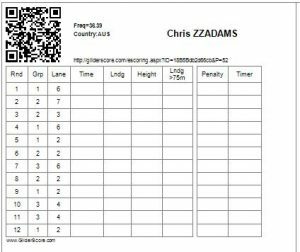 • Real time telemetry as used in the 2016 F-5B Lugo Italy World Championships will be supplied by Organizers and used per paragraph 5.5.1.4. No other energy limiter in the model is needed. • Organization of Starts shall be per Mode A, paragraph 5.5.4.1 f). Lodging/Accommodation : The windward shore contest site is a modest drive (25 miles/47 minutes) from Hawaii’s famous tourist destination Waikiki Beach and Honolulu which has numerous hotels. It is also approximately (19 miles/37 minutes) miles from the North Shore resorts such as Turtle Bay http://www.turtlebayresort.com/. The town of Kailua (15.3 miles/32 minutes) is probably the nearest location for AIR B&B type accommodations. Slope Soaring Party : Following the Competition, the Pilots, their supporters and contest organizers will be the guests of Mr. Barron Gus at his home and private slope soaring site high above Kailua Town. Libations and Hors D’oeuvres will be provided courtesy of our sponsor. The slope site is a ridge with rotors/sink on the backside, landing a little tight, so plan to bring a foamy slope beater, not your composite masterpiece. After months of development and testing, GliderScore v6.52 is available with eScoring support. This enables scores entry via smartphones and computer tablets. This system not only works for F5J contests but also TD, ALES, F3J and many other formats. 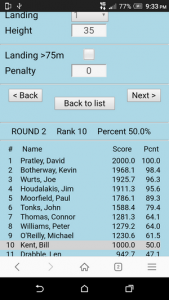 It is a major step forward in contest scoring and a huge timesaver for CDs and scorekeepers. Program author Gerry Carter has done an incredible job making the system as easy to use as possible. 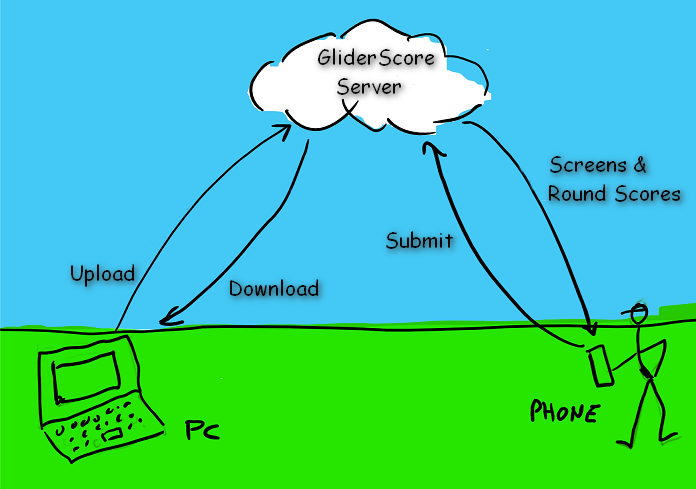 After you have created a new contest in Gliderscore you enable smartphone scoring by clicking a button that uploads your contest configuration to the Gliderscore server. Then you hand out Scoring Record cards to each pilot; this is where the pilot writes down his scores for his personal record. At the top of each of these cards is a QR Code. You scan this code once, at the beginning of the day, to open your own (or someone else’s) personalized scoring web page. After each flight you whip out your smartphone, tap the button for the round just flown and your scoring entry screen pops up. When you are done tapping in your score you Submit it (score is saved on the GliderScore server). From there you can quickly scan any other pilot’s card (once for the day) and enter their scores. Because it’s so easy even guys without smartphones can still have their scores entered quickly this way. The CD/scorekeeper periodically downloads the scores from the GliderScore server. 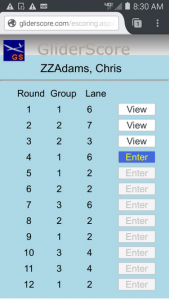 This enables him to see who has not yet entered their scores so he can give reminders if necessary. After every round is completed and the CD is satisfied with the scores, they are then uploaded to the GliderScore server. 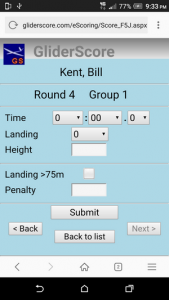 From there any pilot can view the intermediate contest standings on their phones. How cool is that? Certainly any club at least doing F5j should be using GliderScore. And the larger the contest the more you will realize the benefit of GliderScore’s contest automation and eScoring capabilities. Highly recommended! For any clubs that would like to use GliderScore + smartphone scoring I am willing to conduct an online training session for your contest team. Use the Contact form and send me a message if you’re interested. Next stop on the F5J USA Tour is F5J in Vegas. 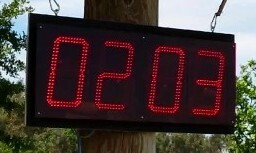 This will happen Apr 23-24 in Sandy Valley NV and is being run by long time contest organizer Jim Monaco. 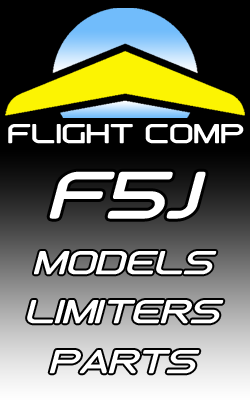 The F5J contest days will immediately follow the 2-day F3J event at the same location. Details for the F5J event are here; the F3J event info is here. Update: Demand for F5J was so strong that it only took just over a day for the full 56 slots to get filled. As of this date there is a waiting list. The event will be jointly run by two CDs: Chris Bajorek and Lenny Keer. Results will be posted when available. If you are familiar with F5J you know that interest is picking up in the US: already 6 two-day contests are on the 2017 season calendar. So it felt like the time was finally right for organizing a USA tour with season standings and end-of-season awards. This tour is modeled after the F5J INTERTOUR (est. 2010) centered in Europe and including events from >25 countries around the world. 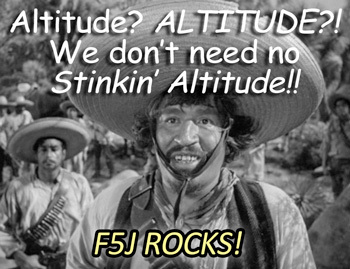 The F5J USA Tour season is Dec 1-Nov 30 which makes F5J in the Desert (Phoenix) our first event every year. Full tour info is here where rules and guidelines are posted. Clubs and organizers are invited to register their 1 and 2-day F5J events by filling out our online application. One of the main benefits of having your event on the Tour is that we expect it will encourage more pilots to attend. The F5J USA Tour Advisory Group includes the following key supporters and pioneers of USA-based F5J: Chris Bajorek, Chairman; Lee Wolfe; Steve Neu; Lenny Keer; Larry Jolly; Jim Monaco. Thank you guys for your willingness to help. Lee Wolfe and the entire enthusiastic East Valley Electric Fliers (Phoenix) club have set the standard for how to run F5J in the US. Their 2-day event from several weeks ago was a great success. Lee has shared some of his F5J contest setup tips here. We hope to see many dedicated ALES pilots trying out F5J in 2017. 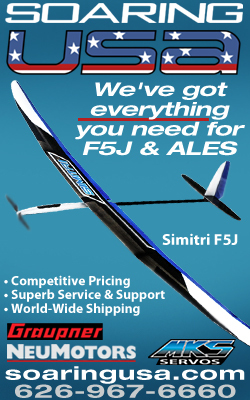 There’s plenty of room for both ALES and F5J in the US! The first F5J regional USA contest for the 2016-17 INTERTOUR season is completed: F5J in the Desert at Queen Creek (Phoenix). A total of 25 pilots flew both days in a challenging and very well run contest. Results are available here. Finally it looks as if F5J contesting is gaining some USA tailwind (so to speak). As of this post there are four 2-day F5J events in the queue for the 2017 season. So with that jump in interest we are launching this website. Since RC Groups (RCG) has been so successful in capturing discussion on F5J the main purpose of this website will be to act as a central place you can view the master F5J contest schedule as well as links to many F5J-oriented discussions and contest event details already posted on RCG and elsewhere. If you have suggestions for other content on this site please don’t hesitate to send them our way!